According to Yonhap News, the New York Times, and BBC News, North Korea has seized a South Korean fishing vessel. North Korea had threatened some sort of retaliation for South Korea’s recent naval drills, and it looks like this is it, or at least, the first. [F]ishing boats from either side have occasionally drifted into the other’s waters, often after engine trouble. How fast they were released often depended on the tenor of bilateral relations at the time. The BBC has an article with more information. One 20-year-old woman from North Hamgyeong province said: “People don’t bother going to the hospital if they don’t have money because everyone knows that you have to pay. “If you don’t have money you die,” said the woman, who left North Korea in 2008. A 56-year-old woman told Amnesty that her appendix was removed without anaesthetic. “The operation took about an hour and 10 minutes. I was screaming so much from the pain – I thought I was going to die. Also, go to this BBC page to see a video. The World Health Organization says North Korea spends the least on health care compared with any other country – less than one dollar per person annually. More evidence of Kim Jong-il’s dementia? Or a clever ruse? I’ve posted before about how there is speculation that Kim Jong-il may be suffering from dementia. Now comes word that he watched the same play in less than two weeks, and then ordered the theater, which is in good condition due to it being renovated seven years ago, to be demolished and rebuilt. The theater was torn down on May 9 just after Kim watched a play there, making his first public appearance since his visit to China early that month. Kim had apparently watched another performance of the same play there on April 27 and after his second visit had enough and ordered it rebuilt. “It’s strange enough to watch the same play twice in less than two weeks, but it’s even more absurd to order the reconstruction of a building that was renovated just seven years ago,” said a South Korean intelligence official. 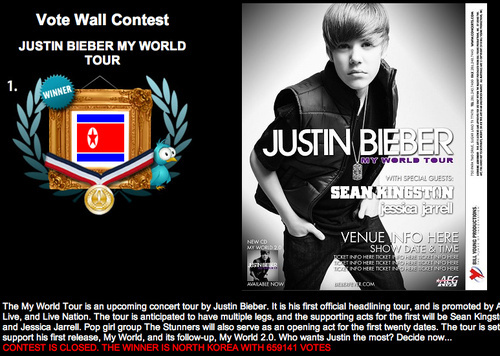 North Korea has won the online contest at Justin Bieber’s world tour site. See here for yourself. Of course, the effect will be limited. First of all, while North Korean bureaucracy decides whether or not to issue young Mr. Bieber a visa, there will be time for the guffaws to die down. In the unlikely event that an invitation is actually offered, he can just come out and honestly admit that he’s been pranked. And let’s say, just for the sake of argument, that he actually decides to go. It wouldn’t be the first time that foreign pop artists have performed in the north. Check out the now-defunct K-pop group Baby Vox performing there. The Norkbots will, as in the video above, just look on impassively* and then give polite applause, as instructed to, and then they’ll recycle the footage as evidence of western decadence. * Or stifle laughter, as at 0:39 in the video above. 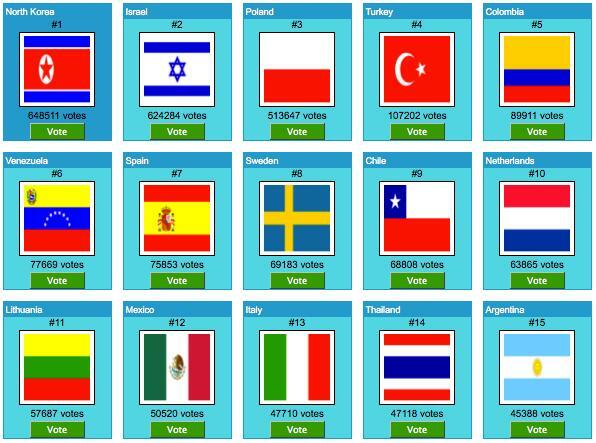 There are only a few hours left to vote, and North Korea is still in the lead. The BBC did an article about it, and got a quote from the North Korean embassy! A spokesman for the North Korean Embassy in London told BBC News that any application for 16-year-old Bieber to tour would be dealt with by its mission to the United Nations, although the matter would be referred to Pyongyang. This post incorporates two things the Marmot hates: Canada and North Korea. Justin Bieber is an inoffensive young man from that hotbed of R&B, Stratford, Ontario, Canada. He’s huge in North America, and if, like me, you didn’t know that, then I guess that’s evidence that Korea really has dropped an iron curtain in front of foreign music. He (or his PR people) decided to generate interest in his upcoming world tour by having an on-line contest to get the fans involved. They could vote for him to come to their country, and Bieber would promise visit the winning country. Some netizen pranksters decided to have a little fun by doing some virtual ballot-box stuffing. As of this writing, the country in the lead is North Korea. The Wonder Girls might get a chuckle out of it. You might recall that one of their former tutors in New York came forward with some allegations that might be disconcerting in America, but are par for the course in South Korea, where the music business has become more business than music. Said tutor allegedly wrote a letter to K-pop blog PopSeoul. I’m sure that Bieber did not want any of his fans to mistreat the Wonder Girls, and I’m equally sure the Girls don’t blame him for the rude behavior of some of his fans. Still, the irony might be a source of amusement for them. Speaking of Justin Bieber, IU (아이유), whom I’ve mentioned before, reminds me a bit of him, in that she can actually play musical instruments well enough to do it live. Unfortunately for her, she lives in South Korea, where everyone has to be pushed into a limited number of cookie cutter molds. If she had been born in Canada or America, I think that her talent would have received more commensurate appreciation. According to the Chosun Ilbo, Kim Jong-il may be showing signs of dementia. North Korean leader Kim Jong-il, who suffered a massive stroke in 2008, has been displaying signs of memory loss and occasionally talks nonsense, National Intelligence Service chief Won Sei-hoon apparently told the National Assembly’s Intelligence Committee in a closed-door meeting. NIS officials apparently showed lawmakers photos of Kim’s swollen left hand, which has been paralyzed since the stroke. The North Korean leader is undergoing therapy and has asked foreign specialists to the country. If this is true, then the end of North Korea’s current regime could be coming soon, and it probably won’t be pretty.